This Norwegian Trollkrem, aka the easiest dessert in the world, is a great dairy free recipe to have up your sleeve for when you have unexpected guests! Sweet, tart and oh so creamy! I participated in Mom Blog Tour Winter Fancy Food Show (#MomBlogTourFF) on behalf of Wendy’s Bloggers. I received Felix products to facilitate my review, but my opinions and the recipe are my own. Other than setting up the nursery, spring cleaning the apartment (cause I don’t wanna bring a baby into a dirty mess) and planning/freaking out over the whole birth part (which I try not to think about too much), there’s also the logistics part of figuring out what is going to happen the day of, for example who’s going to take our dog Lola. I also would love if I managed to cook a bunch of dishes and freeze them for postpartum life. This is my first baby so I have no idea what the etiquette is for when receiving guests who are coming to meet the baby. Do I have to feed them a meal? Coffee and cookies? Should I even be stressing about this now? Probably not! But I’m a hostess by nature, so of course I’ve been thinking about all the possible scenarios. Well, good thing I have a very easy dessert up my sleeve: Trollkrem, or Troll Cream in English. So easy that even a sleep deprived new mom can whip up in no time! It is usually served for New Year’s Eve in Norway, but it makes the perfect dessert for spring and/or summer, doesn’t it? I’m really excited about this post, because I don’t usually post Scandinavian recipes. Not only I’ve never been to that part of the world, but I’m honestly not very familiar with their cuisine. Time to remedy that, for sure! I should start with one of the many Nordic restaurants in Manhattan. A simple Google search had me drooling over all the delicious photos of their dishes. Everything looks so fresh and seasonal! I’d be curious to see if any of those places serve Trollkrem though… since it is such a simple recipe, I’m not sure I’d be willing to spend the big bucks to eat it at a fancy restaurant. Call me cheap, but I’d get the check right after main course and then come home to make my own! ? 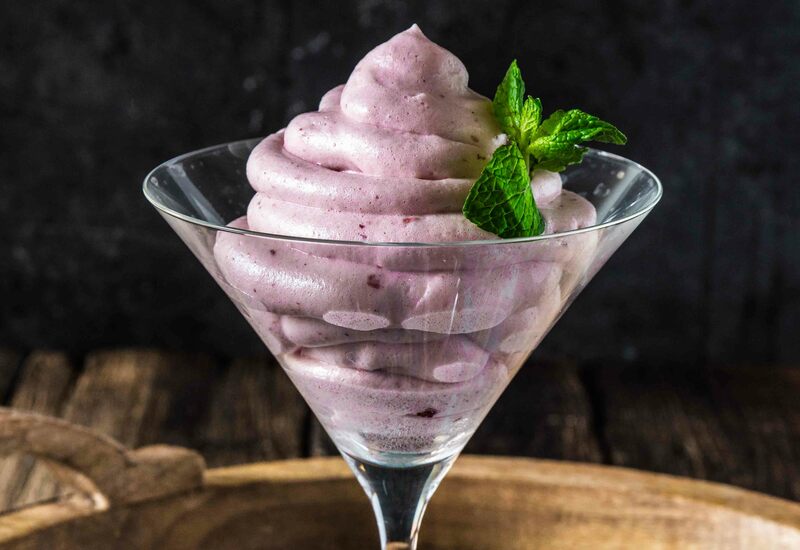 Despite the name – which references trolls, which are mythological Norwegian creatures that live in isolated rocks, mountains or caves -, this dessert is not what you’d call kid friendly. The lingonberries are tart and bitter, so in my opinion Trollkrem is more suitable for adult palates. It is not overly sweet either. Sure, you could add some sugar, but I really wanted the lingonberries to shine! Another option, if making this for kids, would be using another type of berry jam, like strawberry or blueberry. But then it wouldn’t be Trollkrem… And God knows what happens when you mess with the trolls! ??? The first time I tried lingonberries jam was in a famous Swedish furniture store here in NYC. It was served along these delicious and creamy meatballs and I was in love! I would never in a million years think of serving berry jam with meatballs, but somehow that tasted like it was the best combination in the world. It was during the Winter Food Show in San Francisco that I tried Felix Lingoberries. Oh my goodness! Where was this jam all my life? I know where… in Sweden, of course. Unfortunately, lingonberries are not popular in Brazil, so it took me almost 30 years to try it. 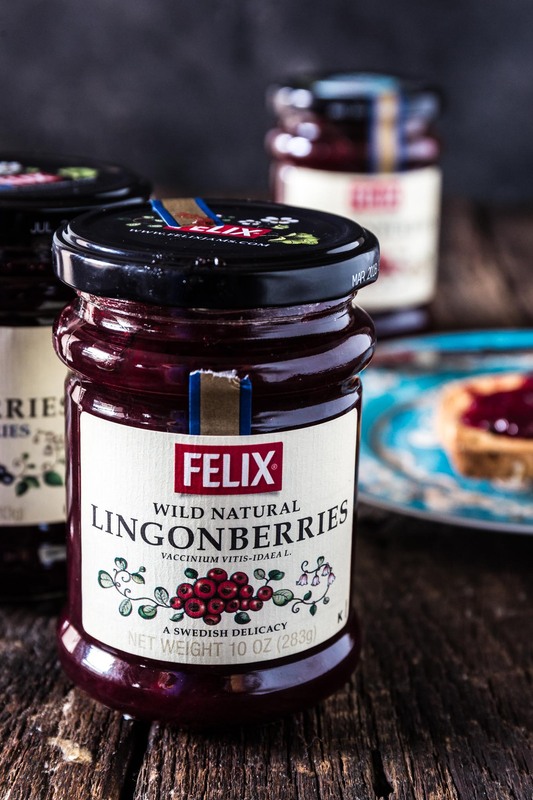 Felix Lingonberries are the leading lingonberry jam in Sweden and the USA, and they come in four different flavors: Original, Lingonberry with Blueberry, Lingonberry with Ginger and Lingonberry with Spiced Apple and Cinnamon. So many delicious savory dishes and desserts can benefit from this jam, or you can simply enjoy it on your toast, waffles or pancakes! Many Swedes are accustomed to picking their own wild berries in the woods. We can’t quite do this here in the US, at least not in NYC, so I’m glad Felix does it for me! Besides, even if I could, I don’t really see myself braving through the forest and possibly encountering some berry loving bears. A trip to the air conditioned grocery store seems more like my thing! ? Now, I realize some people might be scared of the raw egg whites in this recipe. Eggs in the US are pasteurized and are a lot safer than said to be believed. If you go to a fancy restaurant, chances are the mayo they use and their Caesar salad and Hollandaise dressings are made with raw eggs! I wouldn’t be 100% honest if I didn’t warn you that yes, there is a small risk of salmonella in raw eggs. However, a study made by the U.S. Department of Agriculture in 2002 indicated that approximately one in every 30,000 eggs is contaminated with salmonella. That’s about .003% of all commercially produced eggs. Buy your eggs from local small family farms or choose cage-free, organic eggs. Always refrigerate your eggs at or below 40F degrees. Never use an egg if you accidentally dropped part of the shell into the yolk or egg whites, as the salmonella bacteria usually lives on the exterior of the shell. Thoroughly wash your hands and utensils before handling raw eggs. This might sound obvious, but don’t use eggs past the use-by date on the carton. If you’re not comfortable with the small amount of risk, you can always buy those pasteurized egg whites only that come in little jar cartons at the refrigerated section in your supermarket. Or you can pasteurize your own eggs by putting them in 140F degrees water for 4 minutes. The water is not hot enough to cook them, but will kill bacteria. Finally, if you are pregnant like me, wait until your bundle of joy is here as pregnant women are more sensitive to bacterias and shouldn’t consume raw eggs! ? Combine all the ingredients in a clean and dry stand mixer bowl. Make sure the bowl is really clean as residues will inhibit the egg whites from whipping. Beat (using the whisk attachment) at maximum speed for at least 5 minutes or until hard peaks form. 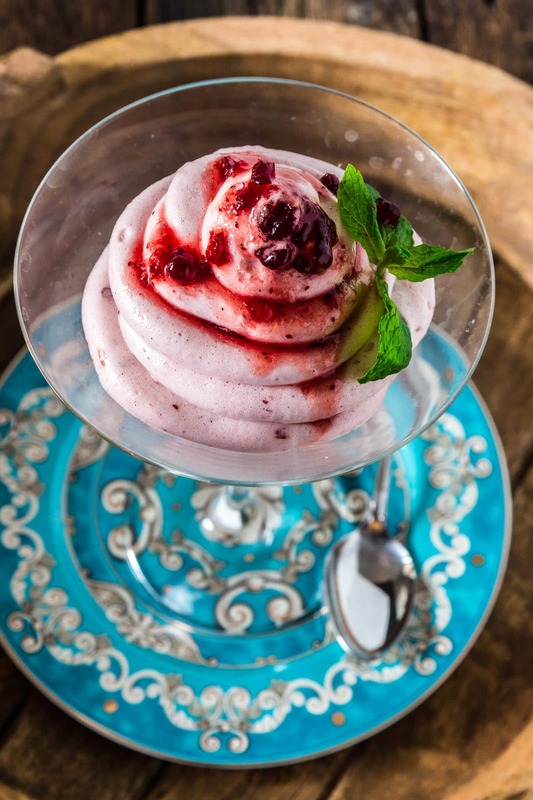 Serve in individual glasses (I use a piping bag for a beautiful swirl effect) decorated with mint or lemon balm leaves and some extra lingonberry jam if desired. 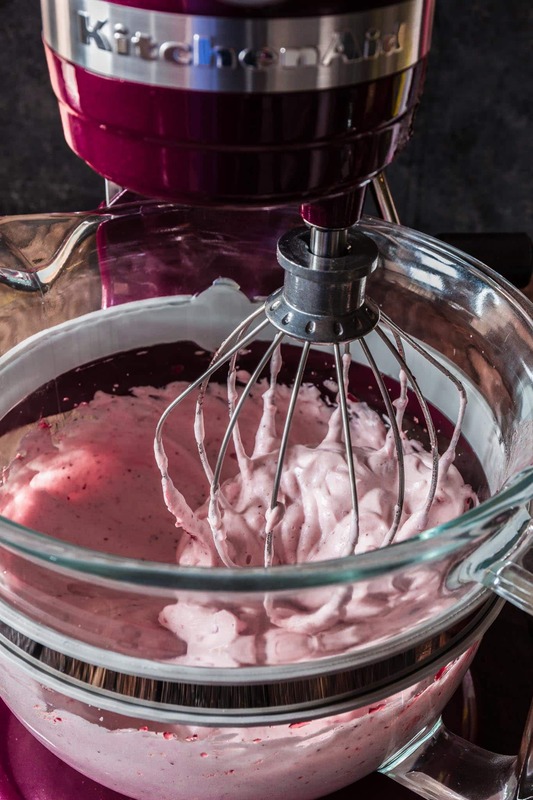 The mousse has to be consumed within 24 hours or the egg whites will start to separate and collapse. Today, I’m proud to announce an amazing giveaway where one lucky winner will win assorted Felix Jams. 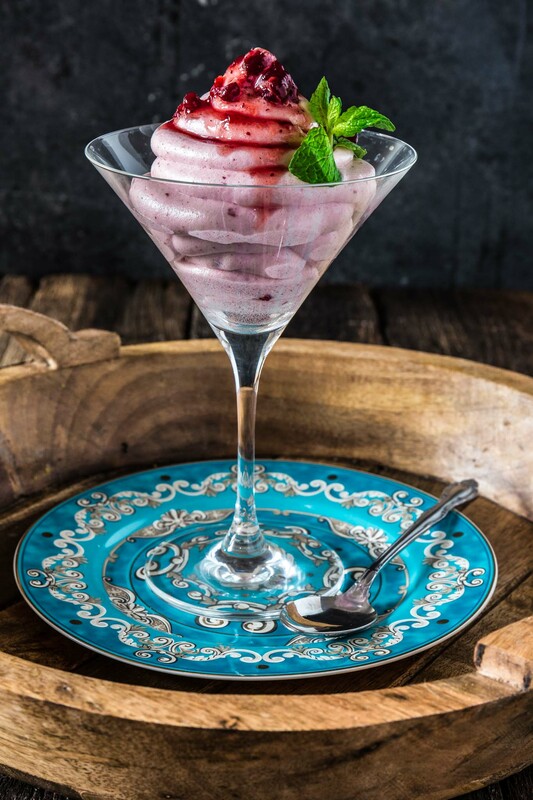 The Lingonberry with Blueberry sounds delicious! I’d love to try the blueberry. Thanks so much. I would like to try the spiced apple cinnamon flavored Lingonberry jam. I would try the Ligon berry with blueberries. I have never tried a of their products. Ooh, the lingonberry sounds delicious and worth a try. I would want to try the Wild Natural Lingonberries Jam first. I had some lingonberry jam at Ikea once and it was delicious. Love blueberries, so that one should be good. Thanks for the chance. The Lingonberry jam looks wonderful! I’d like to try the wild cloudberry jam. I have looked for the Cloudberry Jam. I adore blackberries and raspberries so I need this jam in my life. I Never ate a lingonberry before and would sure like to try it! The Ginger or the Apple/Cinnamon flavors sound really good! I’ve never tasted lingonberries before. I’d like to try the blueberry. It would be perfect in my favorite cookies! Lingonberry with Blueberries sounds wonderful. I would love to try it with a bagel. Lingonberry for the win! I bet it is delicious! Thank you so very much for the chance! I would be beyond thrilled to win! The Lingonberry and Spiced Apple sounds amazing. I want to try the blueberry jam! The spiced apple sounds delicious. The spiced apple sounds amazing! Lingonberries with Spiced Apple and Cinnamon. I would love to try the Lingonberry with blueberry! It sounds delicious!! I think straight Lingonberry Jam would be my first pick. I think I would like to try the Lingonberry with Blueberry. I’m excited to try this since I have never tried lingonberry before. Thank you. I’d love the Ligonberries with blueberry. I eat blueberries every day, and I’ve eated pancakes with Ligonberry butter. So good! Cloudberry jam although I would love to try them all. Thanks. The wild natural lingonberry looks wonderful. I don’t know what cloudberries are, but I bet my kids would be excited to try it. For something I’m familiar with, the Ligonberries with Spiced Apple and Cinnamon sounds good. The two varieties I am most interested in are the Cloudberries and the Lingonberries with Ginger. I’d like to try Lingonberry with Blueberry and Lingonberry with Spiced Apple and Cinnamon. Blueberry jam would be my top pick. i would like to try the Lingonberry with Blueberry it sounds good. I’d like to try the Lingonberry with Blueberry. The cloudberry and the lincolnberry for sure. I want to try the blueberry! The Cloudberry Jam sounds amazing to try. I am most interested in the spiced apple and cinnamon variety. I would love to try the Lingonberry with Blueberry flavor. I would like the Lingonberry with Blueberry. I would like to try the ginger. I would like to try with blueberries. I would like to try the original Lingonberries jam first. Id love to try the Lingonberries with Blueberries jam. mmmm i have never tried Lingonberry jam! it looks so good! I’d like to try them all, but I think I would reach for the Strawberry one first. I would like to try either the Blueberry or the Lingonberries with Ginger! I would like to try lingonberries with blueberries jam. I don’t think I’ve ever had a lingonberry, so I would want to try the one without the added fruits so I can see what it tastes like. The Wild Natural Lingonberry. I’d like to try the ligonberry with blueberry. I would love to try the Spiced Apple and Cinnamon. I would love to try the Cloudberry jam – it sounds so fun! I would like to try the Lingonberry with Blueberry. Strawberry and rhubarb sounds amazing, I’d love to try it. I would most like to try the Lingonberry with Blueberry. I’d like to try Lingonberries with Blueberries. I would like to try the Lingonberry with Blueberries. Sounds tasty! I would like to try the Lingonberries with Spiced Apple & Cinnamon. The strawberry and rhubarb sounds so good. That is what I would like to try. I would like to try the Strawberry and Rhubarb Jam and the Cloudberry Jam. I would like to try all flavors, but lingonberries might be my first choice! I would love to try a few of these, but first the cloudberry! They sound like delicious jams! Lingonberries with Spiced Apples and cinnamon! Lingonberries with Blueberries is would like to try. Original Lingonberry sounds so good love to try it. I’ve never tried Ligonberry before and my son loves anything with blueberries in it. That looks delicious! I’d like to try the Strawberry and Rhubarb jam. I would love to try the Lingonberry with blueberries! That sounds delicious. Eggs in the US are not pasteurized as a rule. They can be had but most are not.